I'm always curious to hear an audience react to the opening scene of 'Grandma's Boy' (1922), Harold Lloyd's first full-fledged feature. It starts with (spoiler alert!) a deceptive pullback shot in which we are first led to believe Harold is doing the manly act of starting a car using a hand-crank. But with the pullback, we discover he's actually operating a hand-cranked ice cream-making machine. Funny, yes. But both of these activities are no longer part of everyday life, so I always wonder how much longer it'll be before that scene might need footnotes to explain it. The rest of the film holds up fine, of course, and I'm looking forward to accompanying it on Thursday, Aug. 29 at the wonderful Leavitt Theater in Ogunquit, Maine. Because 'Grandma's Boy' runs less than an hour, the program will also include an additional surprise attraction. What is it? Hey, if I tell you here, that would ruin the surprise! :) And I've already spoiled one surprise by giving away the opening to 'Grandma's Boy,' so that's enough for one post. For more info about the film and the screening, check out our press release below. Hope to see you there! We've been getting good crowds this summer at the Leavitt, and the series seems to be catching on. The more, the merrier! 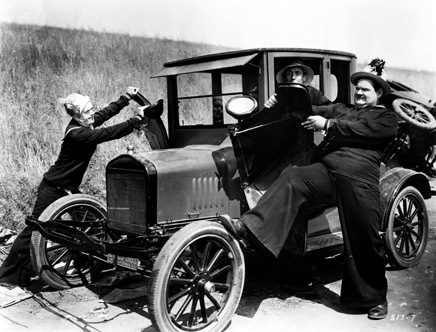 OGUNQUIT, Maine—The silent film era returns to the big screen at the Leavitt Theatre in Ogunquit, Maine with the showing of a classic silent comedy accompanied by live music. Showtime is Thursday, Aug. 29, at 8 p.m. at the historic Leavitt Theatre, 259 Main St., Route 1, Ogunquit, Maine. All are welcome to this family-friendly event; admission is $10 per person general admission. 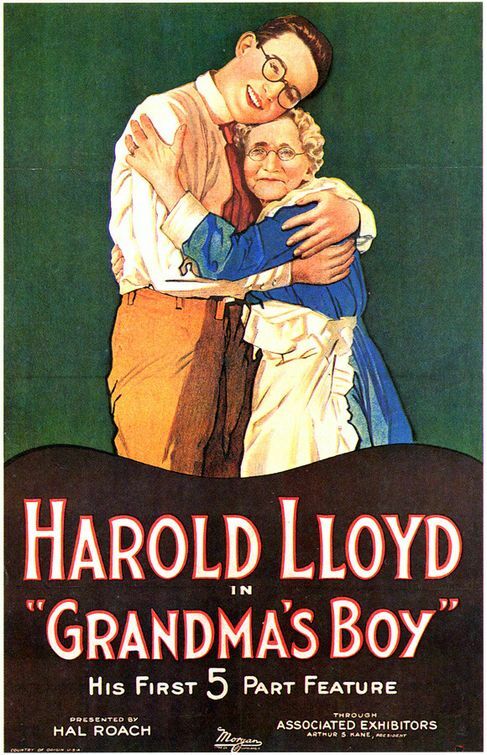 Featured will be a full-length comedy, 'Grandma's Boy,' starring Harold Lloyd, a popular 1920s film star. The screening, the latest in the Leavitt Theatre's silent film series, will feature live accompaniment by Jeff Rapsis, a New Hampshire-based composer who specializes in creating scores for silent films. 'Grandma's Boy' tells the story a cowardly young man (Harold Lloyd) who seeks the courage to battle a menacing tramp who terrorizes his small hometown. Audiences loved 'Grandma's Boy' when it was first released, and the picture helped establish Lloyd as a major star for the rest of the silent film era. With the release of Lloyd's films on DVD, audiences are rediscovering his timeless genius. The reissue sparked a demand for screenings in theaters, where the Lloyd films continue to cast their spell on audiences. Shown in a theater with live music, Lloyd's features maintain their power to delight movie-goers. The Leavitt, opened in 1923 as a summer-only seaside resort silent film house, now offers a wide variety of programming, including first-run films, live comedy, open mic nights, and more. The Leavitt Theatre's silent film series aims to recreate the full silent film experience, with restored prints projected on the big screen, live music, and the presence of an audience. All these elements are essential to seeing silent films they way they were intended, Rapsis said. • Thursday, Sept. 19, 8 p.m.: 'Show People' (1928) starring Marion Davies, William Haines. A silent film about the silent film business! Young Peggy Pepper ventures to Hollywood to make her mark in drama, but finds an unexpected (and unwelcome) flair for slapstick comedy. King Vidor directed this entertaining valentine to a form that would soon be superceded by talking pictures. • Saturday, Oct. 26, 8 p.m.: 'Nosferatu' (1922). Just in time for Halloween, see the original silent film adaptation of Bram Stoker's famous 'Dracula' story. Still spooky after all these years—in fact, some critics believe this version is not only the best ever done, but has actually become creepier with the passage of time. See for yourself, if you dare! ‘Grandma's Boy’ (1922), a classic silent comedy starring Harold Lloyd, will be shown on Thursday, Aug. 29 at 8 p.m. at the Leavitt Theatre, 259 Main St. Ogunquit, Maine. Admission $10 per person; for more info, call (207) 646-3123 or visit www.leavittheatre.com. I'm pleased to report that last Sunday's screening (Aug. 25) of 'The Navigator' was just about the best show we've done in six years of presenting silent films with live music in Wilton, N.H. Attendance was spectacular, with maybe 150 people showing up on a beautiful Sunday afternoon in late August! And Dennis Markaverich, who's run the Wilton Town Hall Theatre for 40 years, said he's never heard such laughter. So it was really one of those great silent film screenings where everything clicked and everyone really let loose. I wasn't expecting this at all, as I've found 'The Navigator' (1924) less likely to generate that kind of reaction than other Keaton features. I just figured a comedy would make for a nice way to cap the summer series of silent film sea-going swashbucklers we've been running there. But in terms of the music, I think I found the right formula for helping 'The Navigator' engage an audience. It's a two-part formula, really. Part 1: show a riotous two-reel comedy short to warm everyone up. In this case, I chose Laurel & Hardy's 'Two Tars' (1928), as it has the required nautical element. This was a risk, too, because I've found that some of the Laurel & Hardy comedies that feature "reciprocal destruction" (which this one does in spades) sometimes shock audiences with the violence depicted on screen. All it takes is one small child bawling in fear, followed by a parent rushing the kid to the exit, to kill the comedy. What kind of music do you use to accompany this? But this time, I found the right approach, playing music of the utmost simplicity—chopsticks, mostly—to give the action the feel of a game for little kids. Which it kind of is, right? The thing is, it really worked! Laughs built upon laughs, and the final shot (of the two sailors in their crumpled car coming out of the tunnel) was greeted with a hearty roar. Nice! And Part 2? That's to back off and play as little as possible for most of 'The Navigator.' Why? Because in order for spontaneous laughter to take root, the audience has to hear itself. And that can't happen if the music is too much. It takes some discipline for me to lay off and let Buster's story unfold, because my tendency is to naturally respond to the on-screen action and want to "play it up." But no—Buster (and many other filmmakers) don't need that. Quite often, less really is more. A little monster music greatly enhanced Buster emerging from the sea in a diving suit, I thought, and the laughter was just tremendous when Kathryn McGuire straddles a floating Buster and paddles back to the ship. Everything after that was pure pay-off, especially the scene where Buster is followed by a miniature cannon all over the deck, which produced shrieks from our audience. I think another factor was way back at the beginning, in the opening remarks, which I again kept brief. For 'The Navigator,' I didn't try to "explain" Buster or get into anything big. All I did was tell the story about how Fred Gabourie, Buster's techical director, was scouting for old square-riggers to be used in 'The Seahawk' when he came across the Buford, an old passenger steamer on the market. Buster told him to buy it, and then they built the story of 'The Navigator' around what turned out to be the largest comedy prop in cinema history. That's all. And for Laurel & Hardy, I said only this: "And before we set sail with 'The Navigator,' let's first see what happens to two sailors on shore leave named Mr. Laurel and Mr. Hardy." Wow, after six years, I think I'm finally learning how to do this! 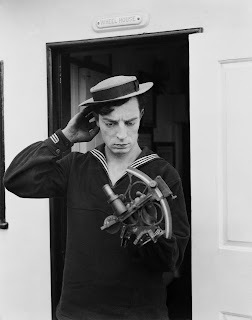 Coming up next: Buster Keaton's great comedy 'The Navigator' (1924), the final entry in our seafaring silent series at the Wilton (N.H.) Town Hall Theatre. Showtime is Sunday, Aug. 25 at 4:30 p.m. I'm looking forward to this one, first because it's a terrific film. But also, it's a film that, despite its reputation as one of the great comedies of the silent era, doesn't seem to draw big laughs. And that to me is a challenge. A Keaton film without yuks? Strange, because most Keaton films produces gales of laughter. But not 'The Navigator. When I've done it, audiences seem to take it in quietly and respectfully. Despite one excellent comic scene after another, the audience reaction is muted at best. Is this because the two characters on the ship are in too much peril for anyone to laugh? Consider: Originally, 'The Navigator' included an extended series of underwater gags near the picture's climax, but Keaton cut this footage to the bone after preview audiences failed to laugh, which stopped the movie's momentum. Keaton's theory was that the situation on deck was just too serious to get away with circus clowning far below, so there was no choice but to "uninclude it," as Sam Goldwyn might have put it. And perhaps tastes have shifted enough since 'The Navigator' was first released so that now the whole movie is colored by this dynamic. Maybe we're just too worried about the couple adrift on the ocean liner that it keeps the comedy from really breaking through into belly laugh territory. Well, on the other hand, Harold Lloyd routinely put his characters in considerable danger, and got laughs all the while. So I wonder. Maybe 'The Navigator' is one of those "smile on the inside" comedies. Maybe we just don't spend enough time on ocean liners any more to find the setting very funny. Maybe our attitudes toward the "idle rich" have changed. In terms of the music, I'll do my best to keep the underscoring quiet for most of 'The Navigator,' allowing audience members to hear each other reacting, which is all part of the experience. Loud music, or too much of it, gets in the way of that happening. Well, don't take my word for it. See for yourself what kind of reaction 'The Navigator' gets by joining us in Wilton on Sunday, Aug. 25. Press release text with complete info pasted in below. 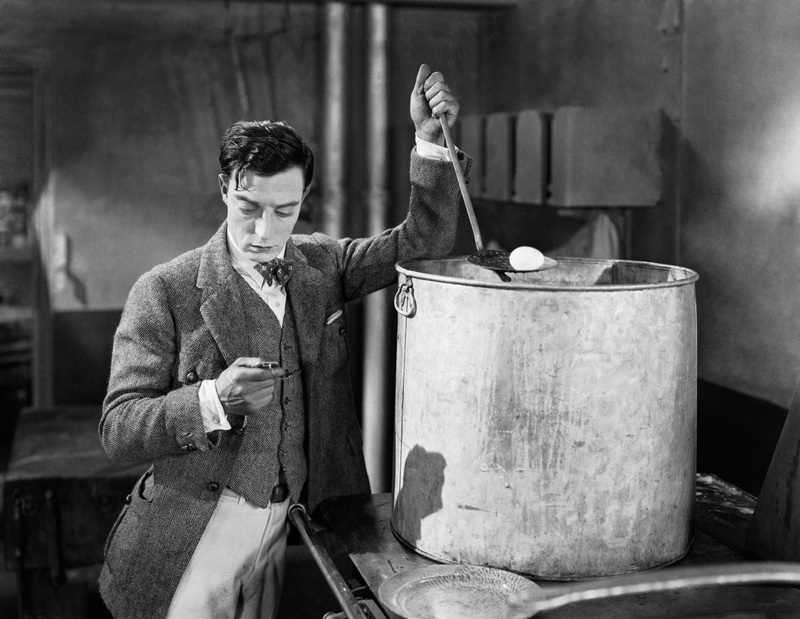 In 'The Navigator,' Buster tries to boiling an egg in a kitchen designed to prepare hundreds of meals at a time. WILTON, N.H.—He never smiled on camera, earning him the nickname of "the Great Stone Face." 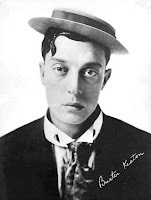 But Buster Keaton's comedies rocked Hollywood's silent era with laughter throughout the 1920s. Acclaimed for their originality and clever visual gags, and also admired for their authentic location shots and amazing stunts, Keaton's films remain popular crowd-pleasers today. 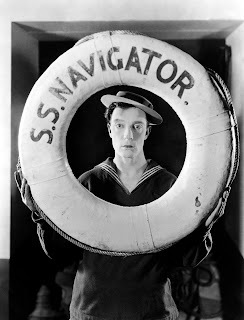 See for yourself with a screening of 'The Navigator' (1924), one of Keaton's landmark features, at the historic Town Hall Theatre in Wilton, N.H. on Sunday, Aug. 25 at 4:30 p.m. The program, which concludes a summer season of silent films set at sea, will be accompanied by live music performed by Jeff Rapsis. Admission is free, with suggestion donation of $5. 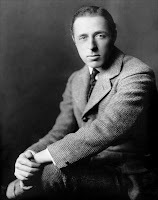 Rapsis, a New Hampshire-based silent film musician who has accompanied shows at venues across New England, said Keaton's films were not made to be shown on television or viewed at home. In reviving 'The Navigator,' the Town Hall Theatre aims to celebrate its roots as a silent moviehouse by showing silent film as it was meant to be seen—in high quality prints, on a large screen, with live music, and with an audience. "All those elements are important parts of the silent film experience," said Rapsis, who will improvise the score on the spot as the film screens. "Recreate those conditions, and classics of early Hollywood such as 'The Navigator' leap back to life in ways that audiences still find hugely entertaining." 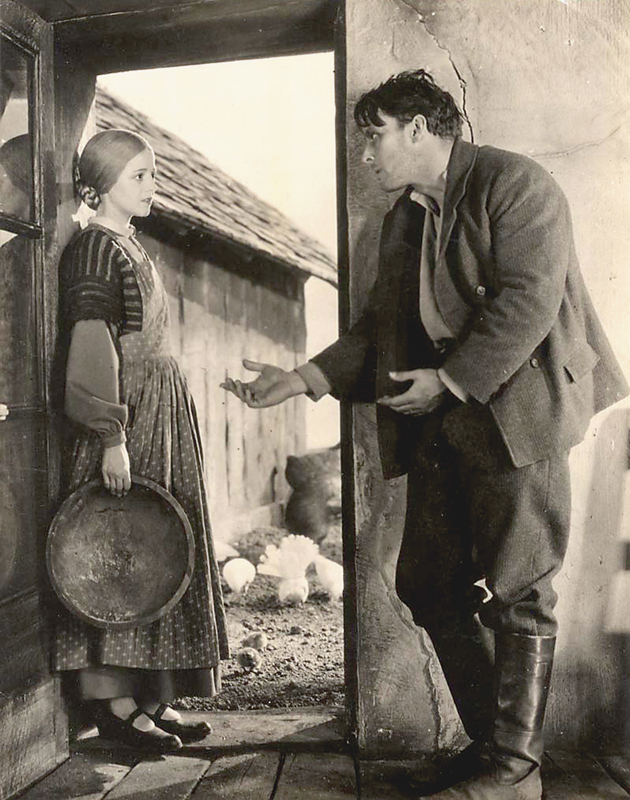 'The Navigator' (1924) will be shown with live musical accompaniment on Sunday, Aug. 25 at 4:30 p.m. at the Wilton Town Hall Theatre, 40 Main St. in Wilton, N.H. The show is free and open to the public, with a suggestion donation of $5 to help defray expenses. It's the final installment in the Town Hall Theatre's summer-long series of sea-faring silent films. For more information, visit www.wiltontownhalltheatre.com; for more information on the music, visit www.jeffrapsis.com. Here's one clue that 'Sunrise' (1927) should be regarded as allegorical fantasy: tubas. They're not visible in the above poster, but yes, there are tubas in the film—or, more precisely, sousaphones. In the idealized city, the house band in a nightspot boasts at least a half-dozen of the big-belled instruments. That's more than most marching bands have! As a tuba/sousaphone player myself, the only time I've encountered that many instruments in one place has been at various Tuba Christmas celebrations over the years. Otherwise, it just doesn't happen. So keep that in mind when we screen F.W. Murnau's masterpiece, which will happen on Thursday, Aug. 22 at the Flying Monkey Moviehouse and Performance Center in Plymouth, N.H. It's a fantasy, folks. It has to be because of the tubas. But before we come together to take in 'Sunrise,' a few notes about shows from this past week. • Peter Clayton, owner of the Leavitt Theatre in Ogunquit, Maine, did it again. 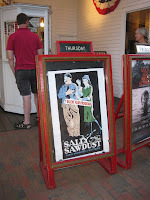 Greeting patrons on Thursday, Aug. 15 was a wonderful sandwich board featuring artwork from 'Sally of the Sawdust' (1925), the evening's silent film attraction. The show went well, despite intermittent distractions from a couple of large insects attracted to my light down below the screen. I got pretty good at swatting them away with one hand while keeping the music going with the other. • And then on Saturday night (Aug. 17), it was up to Ludlow, Vt., where the Friends of Ludlow Auditorium were staging their now-annual silent film night. It's a great place to do these programs because the audiences are so enthusiastic, and also I get to hear another guy do accompaniment. 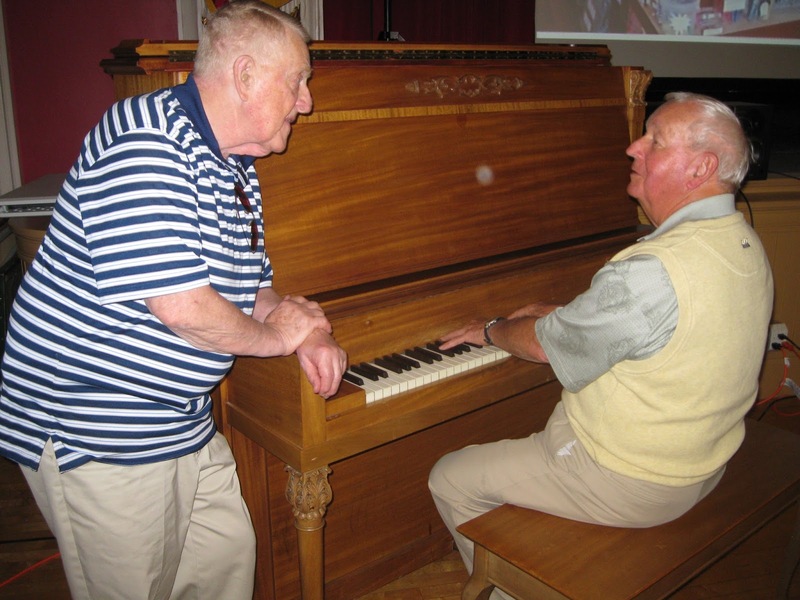 Glenn Brown, a local resident who donated a 1906 upright to the auditorium, handled music for the Buster Keaton short 'My Wife's Relations.' That's Glenn at the piano with Ralph Pace, who organizes all the auditorium's movie screenings. After that, I chipped in with music for Keaton's feature 'Steamboat Bill Jr.' Things got off to a rocky start as the recorded soundtrack to the print we were using was inadvertently left on as the movie opened, and so at first I didn't know what I was hearing underneath my own playing. I thought it was my cell phone going off! But then I realized what it was, and so had to actually stop playing and ask for the soundtrack to be turned off. It eventually was, and things went pretty smoothly from there. But sometimes that kind of thing can throw you mentally, and it can take a lot of effort to get back into the groove. It doesn't help that the opening of 'Steamboat' is actually quite challenging to score, I think, because there needs to be a contrast between music for King's new steamboat and Canfield's old wreck. The music for King can't be too triumphant, and the audience for Canfield can't be too morose, or I think an audience new to the picture might start off rooting for the wrong characters. And then there's 'Sunrise.' I'm looking forward to doing music for this film, one of the great romantic dramas of the silent era. For details and more info, here's the press release that went out earlier. Hope to see you there! Janet Gaynor and George O'Brien in 'Sunrise' (1927). Gaynor won the first-ever Best Actress Oscar in part for her performance. 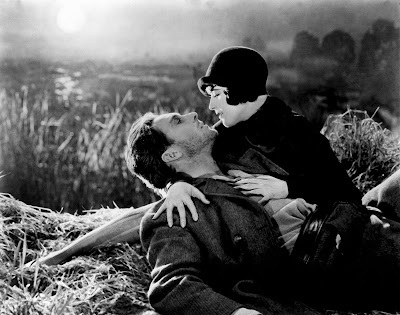 PLYMOUTH, N.H.—Silent film on the big screen with live music returns to the Flying Monkey Moviehouse and Performance Center with the Academy Award-winning romantic drama 'Sunrise' (1927) on Thursday, Aug. 22 at 6:30 p.m. Admission is $10 per person. The screening of 'Sunrise,' starring Janet Gaynor and George O'Brien, will feature music by silent film composer Jeff Rapsis, who will accompany the film live. 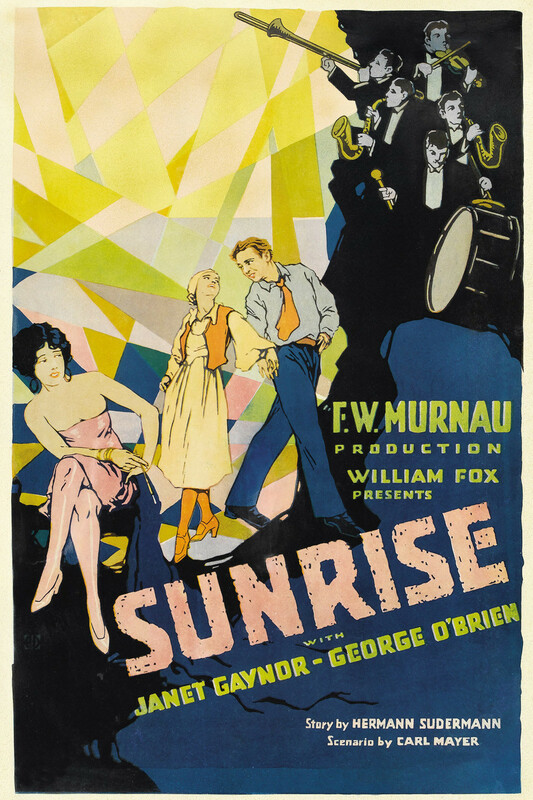 'Sunrise' tells the story of a young country couple (played by Gaynor and O'Brien) whose marriage is threatened by the presence of a woman from the city (Margaret Livingston) who convinces the man to abandon his wife. Will the young husband go through with a plan to kill his wife? Will true love overcome the obstacles of temptation and the promise of short-term pleasure? "F.W. Murnau's 'Sunrise' conquered time and gravity with a freedom that was startling to its first audiences," wrote Roger Ebert in 2004. "To see it today is to be astonished by the boldness of its visual experimentation. The Flying Monkey originally opened a silent film moviehouse in the 1920s, and showed first-run Hollywood films to generations of area residents until closing several years ago. The theater has since been renovated by Alex Ray, owner of the Common Man restaurants, who created a performance space that hosts a wide variety of music acts. Rapsis, who uses original themes to improvise silent film scores, said great silent film dramas such as 'Sunrise' used their lack of dialogue to create stories that concentrated on the "big" emotions such as Love, Despair, Anger, and Joy. Because of this, audiences continue to respond to them in the 21st century, especially if they're presented as intended — with a live auience and live music. "Dramas such as 'Sunrise' were created to be shown on the big screen as a communal experience," Rapsis said. "With an audience and live music, they still come to life as their creators intended them to. So the Flying Monkey screenings are a great chance to experience films that first caused people to fall in love with the movies," he said. The Flying Monkey usually shows silent films on the second Thursday of each month. The screening of 'Sunrise' was shifted to Thursday, Aug. 22, because of a musical booking at the venue. • Thursday, Sept. 12, 6:30 p.m.: 'The Last Command' (1928) starring Emil Jannings, William Powell. Jannings snagged the first-ever Best Actor Academy Award for his towering portrayal of a Czarist general and patriot forced to contend with love and the Russian Revolution in this sweeping late silent drama directed by Josef von Sternberg. • Thursday, Oct. 10, 6:30 p.m.: 'Safety Last' (1923) starring Harold Lloyd, Mildred Davis. The iconic image of Harold Lloyd dangling from the hands of a downtown clock is only one small piece of a remarkable thrill comedy that has lost none of its power over audiences. See for yourself as the film celebrates its 90th anniversary. • Thursday, Oct. 31, 6:30 p.m.: 'Nosferatu' (1922). Celebrate Halloween by experiencing the original silent film adaptation of Bram Stoker's famous 'Dracula' story. Still scary after all these years—in fact, some critics believe this version is not only the best ever done, but has actually become creepier with the passage of time. See for yourself, if you dare! 'Sunrise' will be shown on Thursday, Aug. 22 at 6:30 p.m. at the Flying Monkey Moviehouse and Performance Center, 39 South Main St., Plymouth, N.H. Admission is $10 per person. For more information, visit www.flyingmonkeynh.com or call (603) 536-2551. For more information about the music, visit www.jeffrapsis.com. Here's a thought: If silent film were classical music, then Buster Keaton's feature films might be the cinematic equivalent of Ludwig van Beethoven's symphonies. How so? Well, each film/symphony forms a world unto itself, and each has significant things to say, and each extends the boundaries of form and content in ways that influenced everyone who came after them. So it's possible to think of Keaton's 'Steamboat Bill Jr.' (1928), which we're screening on Saturday, Aug. 17 at Ludlow Town Auditorium in Ludlow, Vt., as comparable to Beethoven's 'Pastoral' Symphony No. 6. Primarily I'm thinking about the storm that features in both works, but also in the outdoorsy feel that both works radiate. In Keaton's film and Beethoven's music, nature is a main character. Also, the Keaton/Beethoven parallel might not be limited to their art. For instance: They both were short, and they both had unusual first names. Okay, back to the movies: along these same lines, Chaplin might be Mozart, one possessed of a freakish gift that broke so much new ground in his chosen field. Mack Sennett and Keystone studios might be like Bach, forging the language itself. Harold Lloyd might be Gluck or Cherubini, composers who were amazingly popular in their day but are now less well-known. Or he might be Haydn, who pumped out symphonies (104 altogether) with a frequency akin to how Lloyd pumped out one-reelers. And Langdon might be Brahms, the value of each man's art resting in large part in its incorporation and renewal of past traditions. Wow, too much for one morning. So let me just say that I'm really looking forward to doing music for 'Steamboat Bill Jr.' in Ludlow this weekend. The program, which starts at 7 p.m., also includes a short comedy with music from a local pianist, so it'll be fun and interesting to be on the bill with someone else. Looking forward to it. 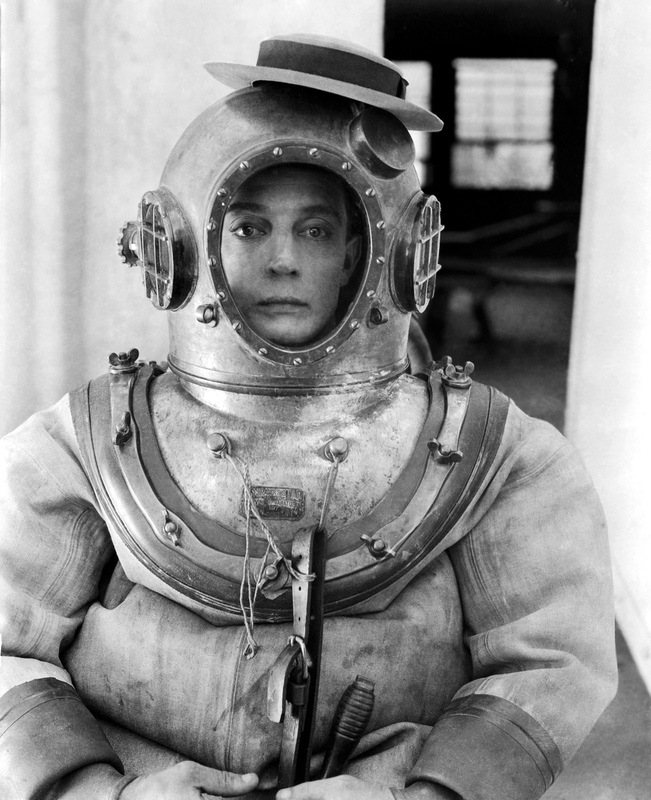 LUDLOW, Vt.—Silent film with live music returns to Ludlow Town Hall in August with 'Steamboat Bill Jr.' (1928), a classic comedy starring Buster Keaton, one of era's top performers. 'Steamboat Bill Jr.' will be revived for one showing only at the Ludlow Town Hall Auditorium on Saturday, Aug. 17 at 7 p.m. The screening, sponsored by FOLA (Friends of the Ludlow Auditorium), will allow audiences to experience silent film in the way its creators originally intended: on the big screen, with live music, and with an audience. The show, like all movies at the Ludlow Town Hall Auditorium, is free and open to the public. 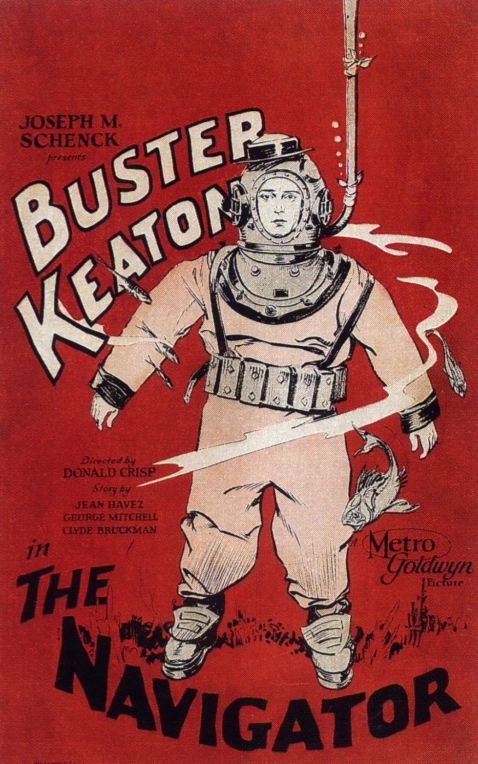 The Keaton feature will be proceeded by a Buster Keaton comedy short feature. For this opening film short, Ludlow resident Glenn Brown will provide the musical background using the 1906 upright grand piano that he donated to the Ludlow Town Hall Auditorium. 'Silent Film Night' at Ludlow Town Hall Auditorium aimed to recreate the era before movies were made with synchronized soundtracks. From about 1900 to 1929, films had no dialogue, and were accompanied by live music at theaters across the country to around the world. Accompaniment could range from a small ensemble or just a single piano in small towns to full orchestras in big city theaters. The screening of 'Steamboat Bill Jr.' will feature live accompaniment by Jeff Rapsis, a New Hampshire-based composer who specializes in creating music for silent film presentations. Rapsis will create a score for 'Steamboat Bill Jr.' on the spot, making up the music as the movie unfolds to enhance the action on the screen as well respond to audience reactions. He will perform the music on a digital synthesizer, which is capable of producing a wide range of theatre organ and orchestral textures. 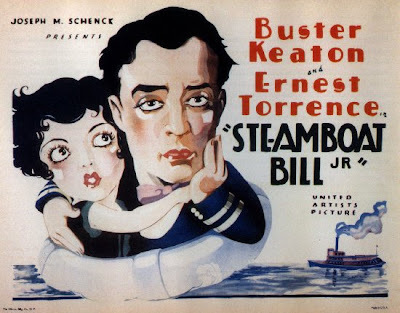 'Steamboat Bill Jr.' will be screened as part of Silent Film Night on Saturday, Aug. 17 at 7 p.m. at Ludlow Town Hall Auditorium, 137 Depot St. in Ludlow, Vt. The screening is sponsored by the Friends of Ludlow Auditorium. Admission is free; donations are encouraged. For more information about the FOLA and its events, visit www.fola.us or call (802) 228-7239. For more info on the music, visit www.jeffrapsis.com. 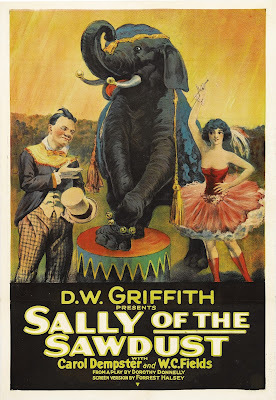 Labels: Beethoven, Brahms, Buster Keaton, Haydn, Jeff Rapsis, Ludlow Town Auditorium, Mozart, Steamboat Bill Jr.
A mustachioed W.C. Fields cavorts with an elephant and starlet Carol Dempster in a poster that captures the atmosphere of 'Sally of the Sawdust' with all the subtlety of—well, the circus. What happens when you put together a silent film director famous for historical epics with a comedian known primarily for his vocal inflections? You get 'Sally of the Sawdust' (1925), a silent comedy/drama directed by none other than D.W. Griffith and starring none other than W.C. Fields. And yes, it's thatW.C. Fields—he of the nasally twang and the racy byplay with Mae West. Long before he was feuding with Charlie McCarthy on the radio, Fields was a very successful actor in silent films. It's surprising to most people, who would naturally think of W.C. Fields in the same category as, say, Groucho Marx. How could they do their stuff without words on a soundtrack? But Fields had a long career as a vaudeville performer who specialized in comedy juggling and pantomime, so he had the chops needed to do the job in motion pictures before dialogue carried the day. Plus, he'd been a headliner all over the country for decades. So for most movie audiences, at least in the United States, he would not have been a complete stranger. So it makes sense in that way, anyway. Besides, at the time, people didn't think of them as silent movies, but simply as the movies. No one would have expected to hear Fields' voice on the screen. And D.W. Griffith directing a comedy? Well, why not? In some ways, comedy can be even more demanding that large-scale historical epics such as 'The Birth of a Nation' (1915) and 'Orphans of the Storm' (1922). So don't dismiss it as a day off. But in this case, Griffith brought something to the table that not everyone had—a knack for telling a tale that sweeps the viewer along so you have to see how it ends. And that makes 'Sally of the Sawdust' more than just a typical 1920s comedy. Underneath it is a multi-generational dramatic story that makes the film a very satisfying experience, I think. And turns out this is related to the stage as well. I read recently how Griffith's own failure as an upscale stage actor led indirectly to his later success in this kind of storytelling. Unable to make a living playing Hamlet, so to speak, Griffith was reduced to playing roles in lurid melodramas craved by small-town audiences. No pretensions in this theater—if you didn't deliver, you'd be pelted with vegetables or run out of town on a rail. So anyone working in this environment honed an ability to know what satisfies an audience. This experience gave Griffith an instinct that served him well when it came time for motion pictures to develop a mass audience. In his bones, Griffith knew what most people really expected from a night's entertainment. And he was able to transfer this knowledge to the motion picture screen at exactly the time (the 1910s) that the business was ready to flourish on a large scale. Griffith's brand of moralistic storytelling went out of fashion as the 1920s progressed. But his melodramatic story-telling instincts never left him, and are on full display in 'Sally of the Sawdust,' carrying the tale along and leaving us helpless to resist. And it says something about the universality of these skills, and about what audiences want, that a film such as 'Sally of the Sawdust' is constructed in such a way that we still respond to it as Griffith intended, even in this age of iPads and smart phones and hybrid cars. OGUNQUIT, Maine—He was a performer who could be recognized just by the sound of his voice. 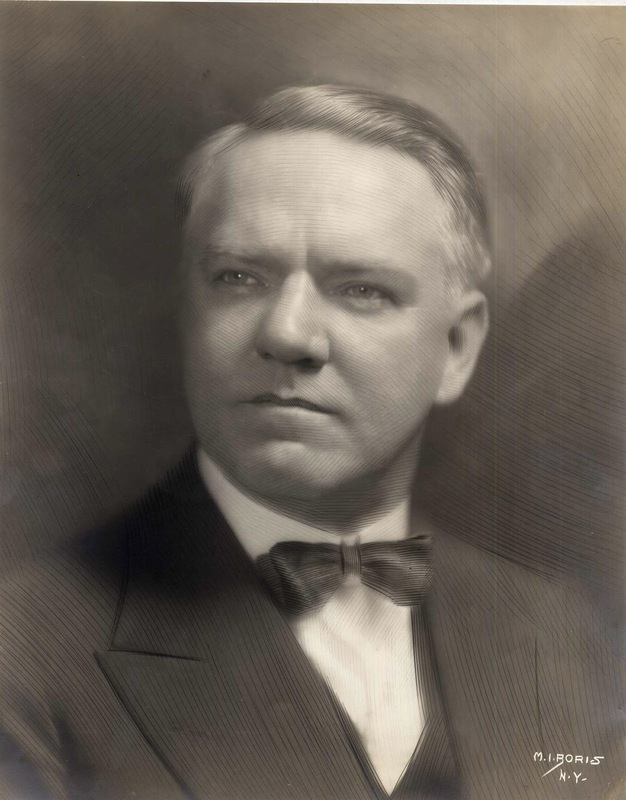 But prior to reaching iconic fame in talking pictures, comedian W.C. Fields starred successfully in silent feature films for Paramount Pictures and other studios in the 1920s. 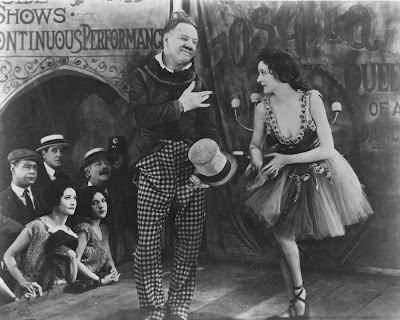 See the non-talking W.C. Fields for yourself in 'Sally of the Sawdust' (1925), one of Fields' most popular silent pictures, in a screening on Thursday, Aug. 15 at 8 p.m. at the historic Leavitt Theatre, 259 Main St., Route 1, Ogunquit, Maine. Admission is $10 per person. Live music will be provided by accompanist Jeff Rapsis, a New Hampshire resident and one of the nation's leading silent film musicians. W.C. Fields remains famous for his comic persona as a misanthropic curmudgeon with snarling contempt for dogs, children and women. Fields achieved lasting fame as a movie star in talking pictures of the 1930s, but his long career encompassed decades on the vaudeville stage as well as a series of silent film roles. In 1925's 'Sally of the Sawdust,' Fields plays Professor Eustache McGargle, a good-natured circus juggler and con man who finds himself responsible for Sally (Carol Dempster), an orphaned girl whose mother has died. 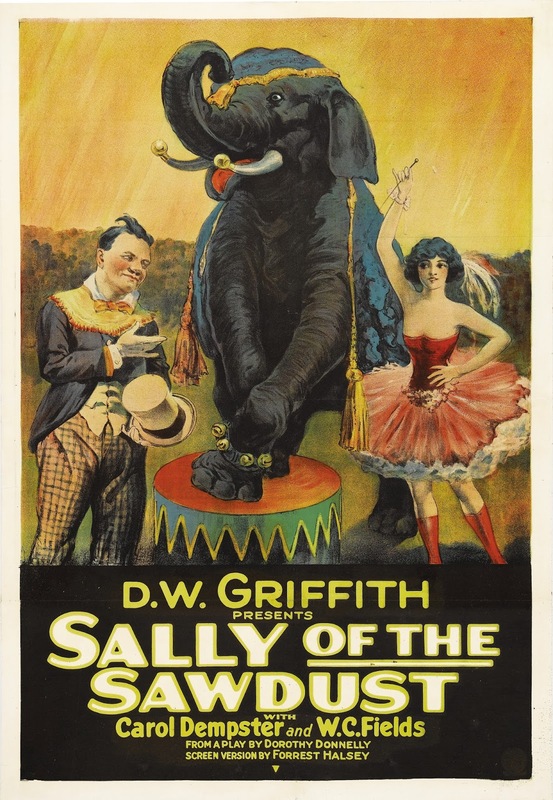 Raised by McGargle, Sally grows up to become a popular performer in the rough-and-tumble world of the circus. But when the show arrives in the town where her mother's relatives now live, Sally is forced to choose between the man who raised her and the wealthy family that wants to reclaim her as their own. 'Sally of the Sawdust,' based on the 1923 stage musical 'Poppy,' gives Fields ample opportunity to display his juggling talents, a staple of his vaudeville act. The film was directed by D.W. Griffith, a rare detour into comedy from a filmmaker known for pioneering epic dramas such as 'The Birth of a Nation' (1915) and 'Orphans of the Storm' (1921). "People find it hard to think of W.C. Fields as a silent film performer, but he was quite successful," Rapsis said. "As a vaudeville performer and juggler, Fields specialized in visual comedy and pantomime that transferred well to the silent screen. Also, as a middle-aged man, he was able to play a family father figure—the kind of role that wasn't open to younger comic stars such as Charlie Chaplin or Buster Keaton. Music is a key element of each silent film screening, Rapsis said. Silent movies were never shown in silence, but were accompanied by live music made right in each theater. Most films, including 'Sally of the Sawdust,' were not released with official scores, so it was up to local musicians to provide the soundtrack, which could vary greatly from theater to theater. • Thursday, Aug. 29, 8 p.m.: 'Grandma's Boy' (1922), starring Harold Lloyd. 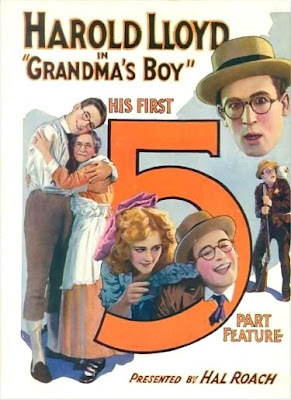 Comedian Harold Lloyd's first starring feature finds him playing a mild-mannered young man forced to confront his chronic cowardice, with a little help from his beloved Grandma, who has a few family secrets up her sleeve. A delightful romp from one of the silent film era's most popular comics. The next installment in the Leavitt Theatre's silent film series will be 'Sally of the Sawdust' (1925), to be screened with live music by Jeff Rapsis on Thursday, Aug. 15 at 8 p.m. at the Leavitt Theatre, 259 Main St., Route 1 in Ogunquit, Maine. Admission is $10 per person; for more info, call (207) 646-3123 or visit www.leavittheatre.com. For more information on the music, visit www.jeffrapsis.com. All cast members on deck! From left, Ernest Torrence, Joan Crawford, and Ramon Novarro in 'Across to Singapore' (1928). So many sea stories, so little time. So, for our "Summer of Silent Swashbucklers Set at Sea" series at the Wilton Town Hall Theatre, we're adding an extra show this weekend. 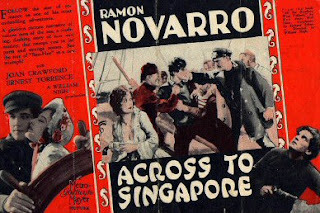 On Sunday, Aug. 11 at 4:30 p.m., we're running 'Across to Singapore' (1928), a little known late silent from MGM that's blessed with a powerhouse cast: Ramon Novarro, Joan Crawford, and Ernest Torrence. The film, like many near the end of the silent period, didn't get a lot of notice, as studios were already in the midst of the mad scramble to begin producing sound pictures in 1928 and 1929. And in the case of 'Across to Singapore,' things got so careless that only a single print is known to survive. And this sole print had begun to decompose when it was copied to safety stock in the nick of time. So it's available to us today only with several scenes marred by the fog of nitrate decomposition, which in some cases makes it look like cast members are playing their roles through a blizzard of static or an avalanche of mud. But that makes 'Across to Singapore' even more interesting to me, and I hope to our audience on Sunday afternoon. Not only are the story and the performances of interest, but in this case you get to see first-hand what happened to so many pictures that are now lost. In many cases, they literally crumbled to dust. 'Across to Singapore' almost joined them in oblivion, and the fact that we can present the complete picture tomorrow to an audience with live music and in a theater is something of a minor pop culture miracle, I think. I guess you'd have to call it "participatory archeology," an experience in which everyone plays a role in bringing the cultural "artifact" (in this case, a romantic drama of the seas from 1928) to life. 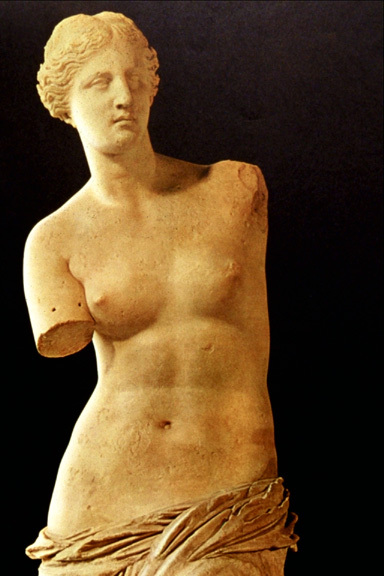 And it makes me think of works of art such as the Venus DeMilo (with its missing arms) and Schubert's 'Unfinished' Symphony, with only the first two movements (out of four) complete. Maybe there will come a time when motion pictures with missing footage will be regarded in the same way—as perhaps even more perfect because of what's not there. I think that way already about 'Sadie Thompson' (1928), a great picture starring Gloria Swanson as a lady with a mysterious past who battles a sanctimonious preacher played by Lionel Barrymore. The conflict between the two builds up magnificently to the final reel, which is...missing! Wow! Just as things reach the boiling point and we're going to get the big payoff we've been waiting for, the actual last 10 minutes of film is just not there for us. Talk about "dramatus interruptus!" And yet 'Sadie Thompson' has been restored and reissued, with titles describing the missing action and pan-and-scan techniques on surviving stills to illustrate it. And at the every end, some footage from a later remake is used to help complete the tale. I've done this film with live music and to me, the effect of the missing scenes is amazing. It almost seems as if mere film just wasn't able to contain the towering conflict between these two very strongb but very flawed characters. And so we move into another realm, where the imagination of the audience is engaged at an even more personal level, supported by music and the materials on screen, in laying out the final battle and the picture's denouement. Somehow, it's more epic because of what's lacking, and what we as viewers must supply ourselves. This is a total accident, but I think it's a very fortuitous one, made possible only by missing film. It doesn't have to be a big climax, either. At the 2012 Cinefest in Syracuse, N.Y., I played music for 'Get Your Man' (1927), a recently restored Clara Bow feature that was missing either Reel 2 or Reel 3—I forget which. Again, the action was summarized by titles and stills, and I did music to help follow the flow of the story as described onscreen, in the hopes of helping each member of the audience come up with his or her unique vision of what the scenes looked like. And I don't know about others, but it was a remarkable little moment that in some ways was better filmmaking that anything that could have actually been put on film. Then there's Raymond Griffith's comedy 'Paths to Paradise' (1925), which ends perfectly at the end of a wild car chase and makes for a very satsifying film. But it's missing its final reel—one in which a plot twist requires the mad chase to be run all the way back to the beginning. That's one that I hope we discover one of these days. WILTON, N.H.—It was among the first feature films to star a very young Joan Crawford, and it was almost lost in the period when Hollywood made the transition from silent films to soundtracks in the late 1920s. But a single 35mm print of 'Across to Singapore' (1928) survived, allowing this timeless and ambitious tale of the sea to be rescued and enjoyed by today's moviegoers. 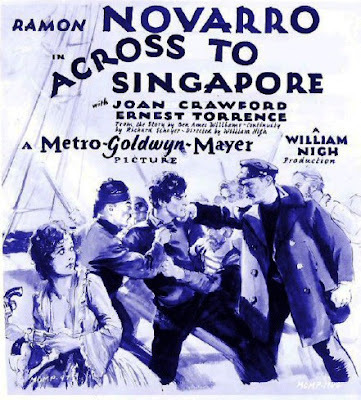 To that end, 'Across to Singapore' will be revived with live musical accompaniment on Sunday, Aug. 11 at 4:30 p.m. at the Wilton Town Hall Theater, 40 Main St., in Wilton, N.H. The show is free and open to the public. It's the latest installment in the Town Hall Theatre's summer-long series of silent films set at sea. "In warmer weather, many people head to the ocean to cool off," said Jeff Rapsis, who provides musical accompaniment for the Wilton Town Hall Theatre's silent film screenings. "This summer, we're bringing the ocean to the theater, as we showcase the enduring romance between Hollywood and the sea." Burly older brother Mark (played by Ernest Torrence), a tough sea captain, is unexpectedly betrothed to Priscilla Crowninshield (Crawford) during a brief visit to home port. But since childhood, Priscilla has had feelings for Mark's younger brother Joel (Ramon Novarro),now preparing to ship out with Mark on his first adventure. "We're thrilled at the chance to screen this picture, which was rescued from oblivion just in time," said accompanist Jeff Rapsis. "Because it's set at sea, we added an extra screening to our usual monthly schedule to fit it in as part of our summer series." Music for 'Across to Singapore' will be created live by Rapsis, who specializes in improvising scores to classic silent films in live performance. For each film, Rapsis improvises a score from original musical material composed beforehand, using a digital synthesizer to recreate the sound and texture of a full orchestra. Each of the silent films on this summer's Town Hall Theatre schedule offers a different porthole into the rich treasure trove of tales rooted in ocean-going traditions. Each also offers footage of scenes that in some cases are now quite historic, including images of ships and ship-board life that vanished long ago. • Sunday, Aug. 25, 4:30 p.m.: 'The Navigator' (1924). Set sail with Buster Keaton's classic comedy 'The Navigator,' which finds two wealthy socialites adrift all alone on a giant ocean liner. Chock full of unique visual gags; one of Buster's most popular features and the picture that helped establish the comedian as a top-tier star in the motion picture business. This summer's nautical-themed movies are part of a monthly series of silent films presented with live music at the Wilton Town Hall Theatre. The series provides local audiences the chance to experience silent film as it was intended to be shown: on the big screen, in restored prints, with live music, and with an audience. 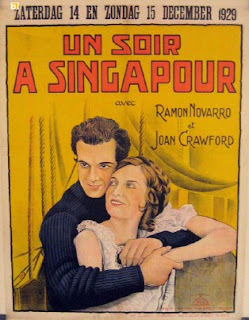 Looks like 'Across to Singapore' was playing as late as December, 1929 in Belgium, judging by this bilingual Flemish/French poster. The series will continue with a screening of 'Across to Singapore' (1928) on Sunday, Aug. 11 at 4:30 p.m. at the Wilton Town Hall Theatre, 40 Main St., Wilton, N.H. Admission is free, with donations of $5 per person encouraged to defray expenses. 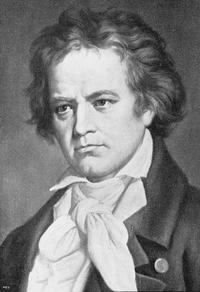 For more information, visit www.wiltontownhalltheatre.com; for more information on the music, visit www.jeffrapsis.com. Darling, we'll have to wait two weeks, until Thursday, Aug. 22, for our appearance at the Flying Monkey in Plymouth, N.H. Yes, sunrise will occur at 6:30 p.m. Nothing's wrong with your almanac—that's when we're showing the great silent film 'Sunrise' (1927) at the Flying Monkey Moviehouse and Performance Center in Plymouth, N.H. Originally set for Thursday, Aug. 8, 'Sunrise' will now take place two weeks later on Thursday, Aug. 22. Same showtime: 6:30 p.m. And same admission price: $10 per person. Should be a good screening, as it's a chance for folks to see a beautiful film—as well as a performance that helped Janet Gaynor snag the first-ever Academy Award for Best Actress. I'll post more later. For now, here's a round-up of recent happenings on the road before they fade from my overcrowded noggin. 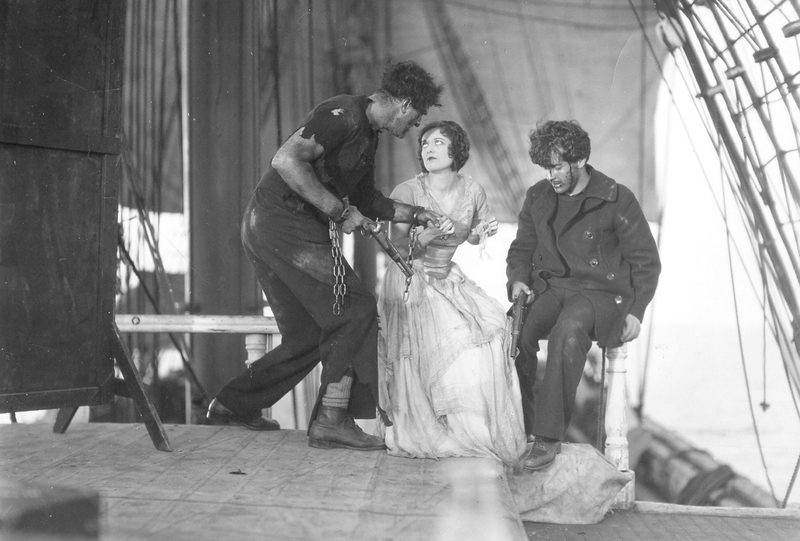 A scene from 'The Seahawk' (1924), the screening of which nearly got scuttled due to a balky car battery. • So near, yet so far: A prolonged heat wave in July did a number on my car battery, to the point where it needed to be replaced. That hadn't quite happened when I headed to the Wilton (N.H.) Town Hall Theater on Sunday, July 28 for a matinee screening of 'The Sea Hawk' (1924), the latest in series of silent sea-faring dramas we're running there this summer. I was early for once, so pulled into a Dunkin Donuts about a mile from the theater for coffee. Instead of the drive-thru, I went in to use the bathroom, then got the coffee at the counter. Came outside to find the car dead as a doornail! The time: 3:52 p.m.—just 38 minutes to showtime, and me with a Subaru Forester filled with synthesizer and sound gear. I tried calling the theater, which is just up the road, but only got the recorded "movie line" and couldn't leave a message. So I called AAA in hopes that a jumpstart would work. The wait was about 45 minutes! Just then a guy came out of the store to get back on his motorcycle, which he'd parked next to my deadster. I asked him if he'd do me a favor, but he said no because he was headed to Greenville. After that, an employee came out and said he could give me a jumpstart. Sure, worth a try! And just as he was backing up his pick-up truck, the AAA guy swung off Route 101 and into the parking lot. It took him all of 90 seconds to jump-start the car, which instantly came back to life. The time: 4:17 p.m. I might make it after all! Saying thank you, I wasted no time getting out on the highway to drive the last mile to the theater. As I sped up, I heard a noticeable "clunk" on my car's roof, and then noticed brown liquid was coating my rear window. The coffee! I'd left it on the roof. Think of it! The very thing I'd stopped to get, and which caused my car to die, was now dribbling down the back of my vehicle. Some kind of evil poetic justice going on there. I had the last laugh, though. During the screening, a violent rainstorm washed away all the coffee residue, so I was back to where I began, minus one cup of coffee. 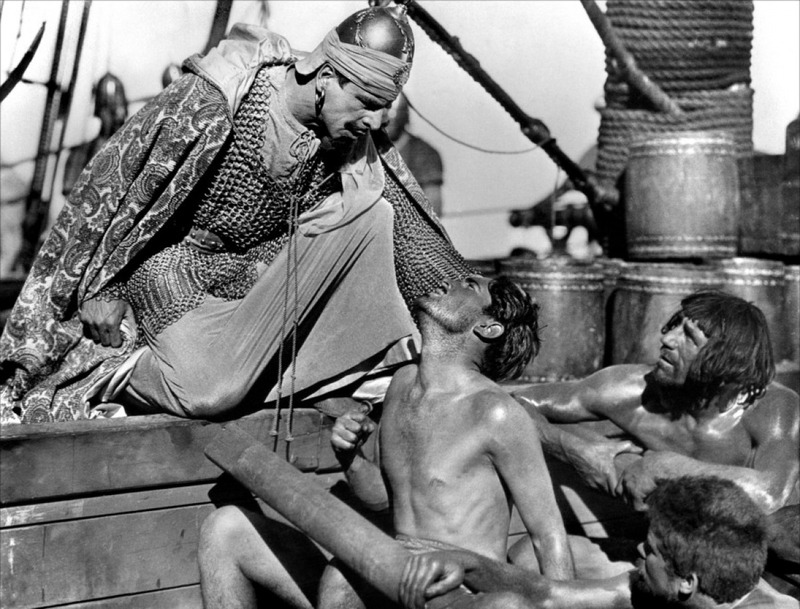 The music for 'The Sea Hawk' (1924), by the way, came together quite powerfully, I thought. I was able to improvise well in modal mode during the "Moorish" scenes set in Algeria. Seen in 2013, the original 'Sea Hawk' emerges as quite a politically charged film. The hero, disgusted by the behavior of people who consider themselves Christians, forsakes his religion and instead joins with the armies of Islam to wage war on the West. Sound familiar? • What? What was that? : On Thursday, Aug. 1, I was thrilled to make my Harvard debut—specifically, at the Harvard Film Archive, which runs a theater that screens a wide variety of esoteric and repertory fare in the Carpenter Center, a big concrete building just off Harvard Yard designed by none other than Le Corbusier. As an example of Le Corbusier's "brutalism" style, the place has all the ambiance of a parking garage. But the film programming can't be beat. This summer, they're running the slate of nine silent films directed by Alfred Hitchcock and recently restored at by the British Film Institute. For silents, they work with a regular roster of accompanists, and it can be hard to break into a situation like that. Despite that, I had recently sent in my resume. Still, I was surprised to be contacted about accompanying one of the Hitchcocks. So down to Harvard I went, to do music for a rare Hitchcock comedy, Champagne (1928), on the Harvard Film Archive's nice Yamaha baby grand. It had a bright sound, but the action wasn't nearly as heavy as other Yamahas I've played, so off we went. Before we started, I may have made a faux pas. Before an audience of probably 75 people, programmer David Pendleton was ready to start things off with a few remarks about the film. I had been playing "silent film cocktail music" to warm up, so it seemed only natural to segue to David by means of a modest fanfare. People laughed somewhat, and then David noted dryly it was the first time he'd ever been preceded by a fanfare. First time? I had to remember: this was not the Wilton Town Hall Theatre, and I really should be on my best behavior. But then the film started, and I opened up with a dramatic upwards glissando straight out of Carl Stalling score for a Bugs Bunny cartoon. And I'm afraid from then on, the die was cast. Because 'Champagne' was a light comedy with a lot of dance scenes, I'd chosen material that was energetic to begin with, and the excitement of the occasion (a new venue, a new film) didn't slow things down, either. Still, I thought it all came together pretty well, with the music underscoring the comic moments well enough and also adding the right amount of mystery and intrigue that works with any Hitchcock film, even if no bodies are lying around. Afterwards, people were kind enough to stop and chat. And I was curious: How did I do? I've learned that you should be careful when asking that question, because you may not like the answer. "Well, what you played was very...loud!" "Yes. Perhaps in the future you could keep the lid flat on the piano." Ouch! They found me LOUD at Harvard! But I also had some kind comments about how the music did support the movie and helped it come to life. David seemed open to the idea of me returning at some point, and that's great! 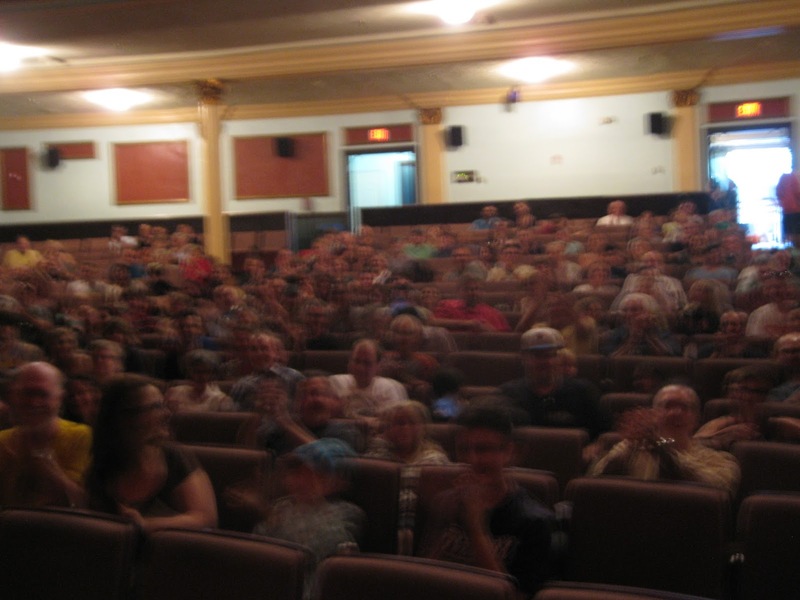 • Brush with celebrity: Saturday, Aug. 3 brought me up to Brandon Town Hall in Brandon, Vt., where we screened 'Sally of the Sawdust' (1925) to an appreciative crowd of just under 100. Starring W.C. Fields and Carol Dempster, and directed by D.W. Griffith, I've found this film really does have the Griffith story-telling touch, despite its reputation as a lesser picture. 'Sally of the Sawdust' has that peculiar "inevitable" quality of Griffith films, in which the narrative pull is so strong as to be irresistible. Afterwards, I got to talking with a few folks, including one gentleman I'd never seen before. A nice guy, maybe 60, kinda big at 6-foot-4, and musically knowledgeable—so much so that I asked about his background. Oh, he said, his grandfather was the real musician in the family, and had worked as a composer years ago on Broadway and in Hollywood. Who was he? No one I'd know, he said. 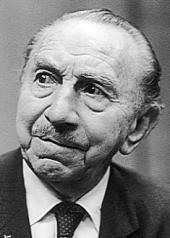 And then he said the name: Rudolf Friml. Rudolph Friml? The Rudolf Friml? Composer of music for shows such as "Rose-Marie" (1924), which includes the immortal 'Indian Love Call' made famous by Nelson Eddy and Jeannette McDonald in the 1936 film? Yes! He himself was Bill Friml, and Rudolf (who lived into his 90s, until 1972) was his grandfather. That's a picture of Rudolf in later life. I later checked into Friml's life story, and found that in his native Prague he was a student of none other than Antonin Dvorak. Also, in the 1930s he claimed to use a Ouija board to communicate with deceased fellow operetta composer Victor Herbert, and as an older man, he'd start every morning by standing on his head to get blood to the brain. Colorful guy! • General Approval: I'll keep this short but I need to say that the silent film screenings I'm doing at the Somerville Theater in Somerville, Mass. are turning out to be the highlights of each month. We've been getting good crowds, and our screening of Keaton's 'The General' (1926) on Sunday, Aug. 4 was no exception: more than 200 people showed up on one of the finest afternoons of the summer to sit in a darkened theater and take in this exciting film on the big screen, as it was intended. It's gotten to where I feel comfortable at the Somerville, and so I now find it relatively easy to get into the zone where good accompaniment happens. With 'The General,' a film I know well, it happened almost instanteously, and the music came easily and effectively throughout the show. So it was one good moment after another, and about two-thirds through the film, I began to feel that nice glow that happens when I know I'm nailing a film. Even the ending came together naturally, producing lots of satisfying laughs from the on-screen action as the music pulled things to the end. And after that, I got one of those amazing ovations that you never expect to get in life, but there it was. It was, of course, for Buster's film, but I stood up anyway and took a bow. Very satisfying to have collaborated with Mr. Keaton in such an endeavor and one of the most satisfying moments of this journey so far. 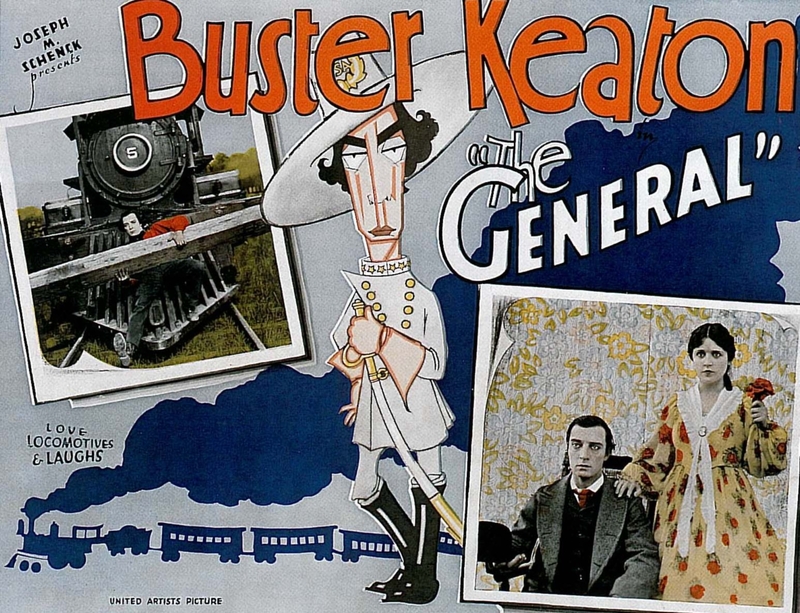 This weekend: W.C. Fields in Brandon, Vt.
and Keaton's 'The General' in Somerville, Mass. 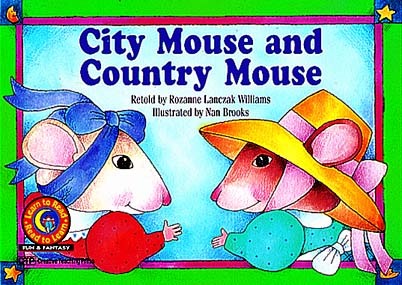 Sometimes I feel like I'm in that children's book, "Country Mouse, City Mouse." On Saturday, I go way up to rural Brandon, Vermont to do music for a screening of 'Sally of the Sawdust' (1925), a silent film that stars W.C. Fields. Then, the next day, it's down to big bad Boston for a screening of Buster Keaton's 'The General' in 35mm at the Somerville Theater. And if I had to choose which one I'm looking forward to more, I really couldn't. The Vermont screening of 'Sally of the Sawdust' will be in town hall with wonderful acoustics, and we usually get a large and very appreciative audience right from within the small community. I feel very much at home there and find it's a place where I have a pretty high batting average. Plus it's nice to make the drive through rural New England in mid-summer, with the corn coming in and the Red Sox game on AM radio. The screening of 'The General' in Somerville, Mass. will happen under completely different circumstances: in an actual movie theater with a huge screen, with first class 35mm film projection, and in the middle of one of the most congested urban areas in our part of the world. The audience will come from around the metro area, and will include a high proportion of students of cinema, both young and not-so-young. Country or city? I guess I'm blessed that I don't have to choose, but get to experience them both. And so can you: W.C. Fields in rural Vermont on Saturday, Aug. 3 and then Buster Keaton in the big city on Sunday, Aug. 4. I'm pasting in the text of the respective press releases below, but they both promise to be excellent silent film programs, so hope to see you there! BRANDON, Vt.—He was a performer who could be recognized just by the sound of his voice. 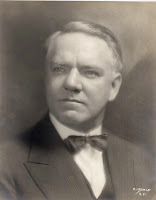 But prior to reaching iconic fame in talking pictures, comedian W.C. Fields starred successfully in silent feature films for Paramount Pictures and other studios in the 1920s. See the non-talking W.C. Fields for yourself in 'Sally of the Sawdust' (1925), one of Fields' most popular silent pictures, in a screening on Saturday, Aug. 3 at 7 p.m. at the Brandon Town Hall and Community Center, Route 7 in Brandon, Vt.
W.C. Fields remains famous for his comic persona as a misanthropic curmudgeon who remained a sympathetic character despite his snarling contempt for dogs, children and women. Fields achieved lasting fame as a movie star in talking pictures of the 1930s, but his long career encompassed decades on the vaudeville stage as well as a series of silent film roles. W.C.Fields and Carol Dempster in 'Sally of the Sawdust' (1925). "People find it hard to think of W.C. Fields as a silent film performer, but he was quite successful in them," Rapsis said. "As a vaudeville performer and juggler, Fields specialized in visual comedy and pantomime that transferred well to the silent screen. Also, as a middle-aged man, he was able to play a family father figure—the kind of role that wasn't open to younger comic stars such as Charlie Chaplin or Buster Keaton. The screening of 'Sally of the Sawdust' is sponsored by by Lorraine and Warren Kimble; Frank and Ettie Spezzaro; and Terry and Dottie Kline. 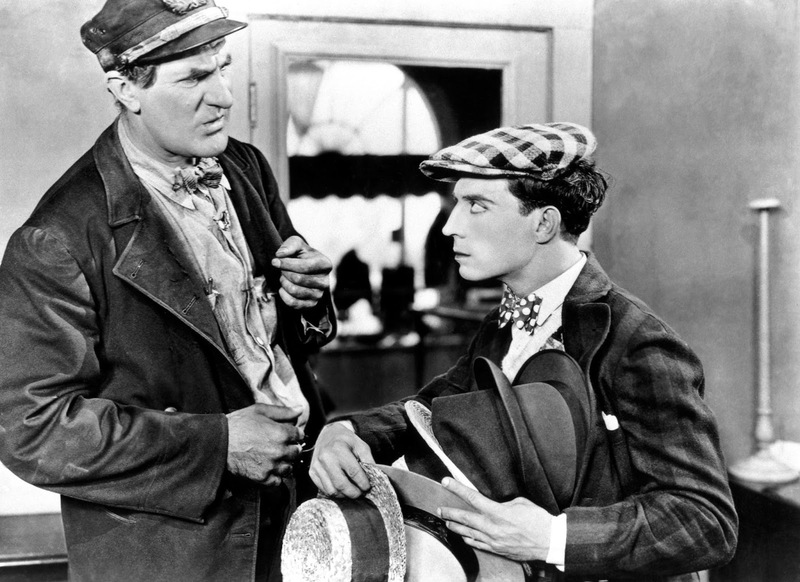 • Saturday, Sept. 14, 7 p.m.: "Lloyd and Keaton: Silent Comedy Double Feature." In 'Dr. 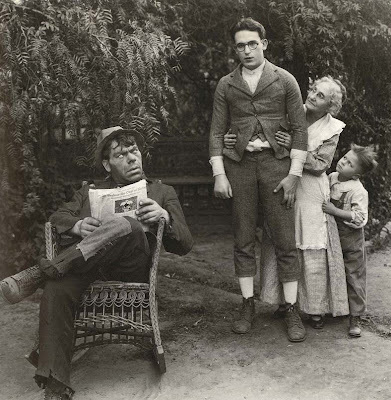 Jack' (1922), Harold Lloyd stars as a country doctor with unorthodox methods that get results! But now comes his toughest case yet: a poor little rich girl (Mildred Davis), bed-ridden with a mysterious condition. Harold's cure is sure to make audiences smile! 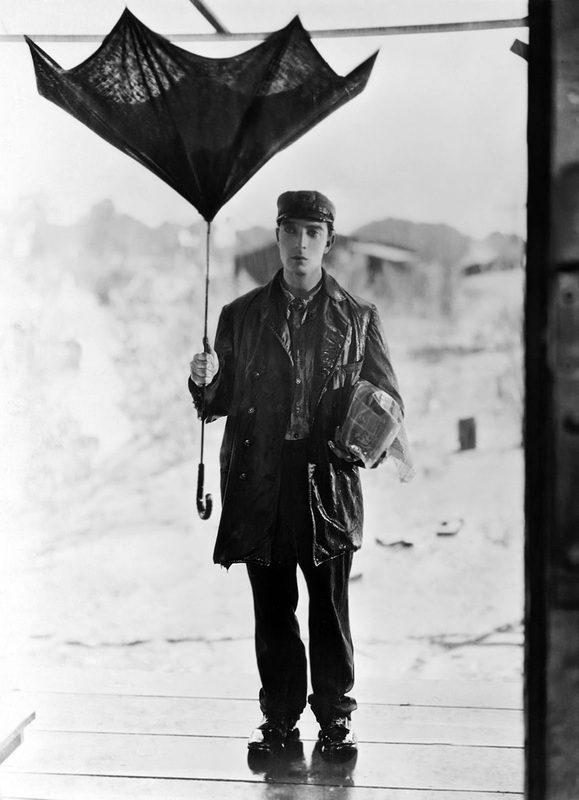 In 'Seven Chances' (1925), Buster will inherit a fortune provided he's a married man...by 7 p.m. today! Classic Keaton comedy, complete with one of the best silent film comedy endings ever. Screening sponsored by Pam and Steve Douglass. • Saturday, Oct. 19, 7 p.m.: "Nosferatu" (1922). The annual "Chiller Theater" presentation in the as-yet-unheated Brandon Town Hall. Just in time for Halloween, see the original silent film adaptation of Bram Stoker's famous 'Dracula' story. Still scary after all these years—in fact, some critics believe this version is not only the best ever done, but has actually become creepier with the passage of time. See for yourself, if you dare! Screening sponsored by Heritage Family Credit Union. The next installment in the Brandon Town Hall's silent film series will be 'Sally of the Sawdust' (1925), to be screened with live music by Jeff Rapsis on Saturday, Aug. 3 at 7 p.m. at the Brandon Town Hall and Community Center, Route 7 in Brandon, Vt. Admission is free; donations are encouraged, with proceeds to support ongoing renovation of the town hall. For more information, visit www.brandontownhall.org. For more info on the music, visit www.jeffrapsis.com. Silent film classic 'The General' in 35mm on Sunday, Aug. 4 in Somerville, Mass. SOMERVILLE, Mass.—He never smiled on camera, earning him the nickname of "the Great Stone Face." But Buster Keaton's comedies rocked Hollywood's silent era with laughter throughout the 1920s. Acclaimed for their originality and clever visual gags, and also admired for their realistic stories and authentic location shots, Keaton's films remain popular crowd-pleasers today. See for yourself with a screening of 'The General' (1926), one of Keaton's landmark features, on Sunday, Aug. 4 at 1 p.m. at the Somerville Theatre, 55 Davis Square, Somerville, Mass. 'The General' will be screened in 35mm film in the Somerville's main house. The program will be accompanied by live music performed by silent film composer Jeff Rapsis. General admission is $15 per person. 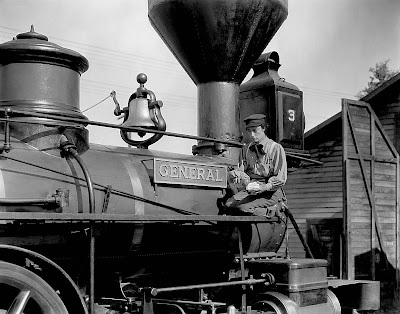 'The General,' set during the U.S. Civil War, tells the story of a southern locomotive engineer (Keaton) whose engine (named 'The General') is hijacked by Northern spies with his girlfriend onboard. Keaton, stealing another train, races north in pursuit behind enemy lines. Can he rescue his girl? And can he steal his locomotive and make it back to warn of a coming Northern attack? Although the film includes vivid and realistic battle scenes, 'The General' is family entertainment suitable for all viewers, with the exception of very young children. Critics have hailed 'The General' Keaton's masterpiece, praising its authentic period detail, ambitious action and battle sequences, and its overall integration of story, drama, and comedy. It's also regarded as one of Hollywood great train films, with much of the action occurring on or around moving steam locomotives. The screening is the latest in the Somerville Theatre's monthly silent film screenings. Dubbed 'Silents, Please,' the series aims to showcase the best of early Hollywood the way it was intended to be experienced: in 35mm prints, on the big screen, with live music, and in a theater with an audience. "All those elements are important parts of the silent film experience," said Rapsis, who improvise the score on the spot as the films screens. "Recreate those conditions, and the classics of early Hollywood leap back to life in surprising ways that can still move audiences today." Buster and his mechanical co-star in 'The General' (1926). While making films, Keaton never thought of himself as an artist, but rather as an entertainer trying to use the then-new art of motion pictures to tell stories and create laughter. As a performer, Keaton was uniquely suited to the demands of silent comedy. Born in 1895, he made his stage debut as a toddler, joining his family's knockabout vaudeville act and learning to take falls and do stunts at an early age. "What makes the film so special is the way the timing, audacity and elegant choreography of its sight gags, acrobatics, pratfalls and dramatic incidents is matched by Buster’s directorial artistry, his acute observational skills working alongside the physical élan and sweet subtlety of his own performance." • Sunday, Sept. 8, 1 p.m.: 'The Freshman' (1925) starring Harold Lloyd. Get in a back-to-school mood with Lloyd's genre-defining comedy about a young man's climb to social prominence via the college football squad. Great story aided by top-rate silent film comedy. • Sunday, Oct. 6, 1 p.m.: 'Safety Last' (1923) starring Harold Lloyd. Landmark comic romp that finds go-getter Harold, eager to climb the corporate ladder, instead forced to clamber up the exterior of a towering downtown department store. Hilarious as well as terrifying; one of the great thrill rides of the cinema. • Sunday, Nov. 17, 1 p.m.: 'Peter Pan' (1924) starring Mary Brian, Betty Bronson, Ernest Torrence. 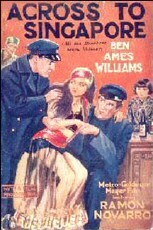 Original silent film adaptation of J.M. Barrie's stage classic, supervised by the author himself, retains its appeal to children of all ages, especially ones who refuse to grow up. Heartfelt acting, imaginative set design, and pioneering special effects combine to create pure visual magic. Buster Keaton's 'The General' (1926) will be shown in 35mm on Sunday, Aug. 4 at 1 p.m. at the Somerville Theatre, 55 Davis Square, Somerville, Mass. Admission is $15 per person. For more information, call (617) 625-5700 or visit http://www.somervilletheatreonline.com.